Plain and simple: bad leadership. While I know a lot of folks disagree with me, I stick by my feelings that Ollie’s lack of leadership in certain areas can be highly damaging when compromised—which tonight’s episode demonstrated perfectly. Yes, he’s excellent in the field. When carrying out missions, he’s in the zone, quick on his feet and always has a plan. To use a hockey reference, the most successful power play units usually have what’s referred to as a “quarterback” on the power play. This is the guy who takes charge, sets up plays and is usually the catalyst for generating offense in that situation. There’s no question that Ollie is the quarterback for the team when they’re fighting on the streets. Heck, we even saw him taking charge during the crossover event by rallying the troops and developing strategy. But for as good as he is in that role, he has some glaring weaknesses. The most prominent of which is his inability to lead outside the battlefield. I’ve said this before, but my biggest hang up with Ollie is the fact that he wants to be Green Arrow and the mayor of a major metropolitan city at the same time. Not only that, but he’s so casual with his identity. It doesn’t take a genius to know that living this kind of double life is extremely careless and very dangerous—for him, his teammates and the citizens of Star City. If I’m Ollie, there’s no way I would ever take a high-ranking position that would have me under a constant microscope and regularly in the in the public eye. He should be trying to fly so far under the radar that he’s nonexistent. Live off your parents’ money (if it’s still around) or grind it out in a low profile job and fight crime in your free time. Yes, I understand his position grants him the ability to have his finger on the city’s pulse and know what’s going on at all times, but he could make those same connections and not be the face of the city. As soon as you decide to be the mayor/Green Arrow and invite a handful of people to be on your team and know your identity, you add so many moving parts and instantly complicate the situation. This is where Ollie’s weakness as a leader shows. When I think about a good leader, I think about someone who doesn’t necessarily need to be the smartest person, but someone who is able to talk with/to people and inspire them to be the best they can be, so you get the best out of them, while also understanding their strengths and weaknesses and being able to address those. Sure, Ollie has had encouraging conversations off the battlefield with varying team members, but it’s usually after an issue. He doesn’t really do the preventative work that helps to stop issues before they happen. Tonight was a really good example of that. Ollie just assumes everyone is on the same page and as committed as him. I suppose that’s how it should be, but as a leader, he needs to make sure of that. I can’t believe with the FBI breathing down his neck and getting closer and closer every day, he can’t understand the severity of it and acknowledge that there are others who have large stakes in the game—as illustrated by Rene’s betrayal. Oliver’s handling of Rene’s actions is even worse. Instantly kicking him off the team instead of trying to figure out a plan B (with the team) to this very serious issue? Granted, I can understand his anger, but he’s unable to see Rene and the other team members’ skin in the game and how a knee-jerk reaction to Wild Dog would cause a massive ripple effect with others who might feel the same way. Not everything has to be sunshine and rainbows, but you have to make the effort so you understand your team and where they are mentally. 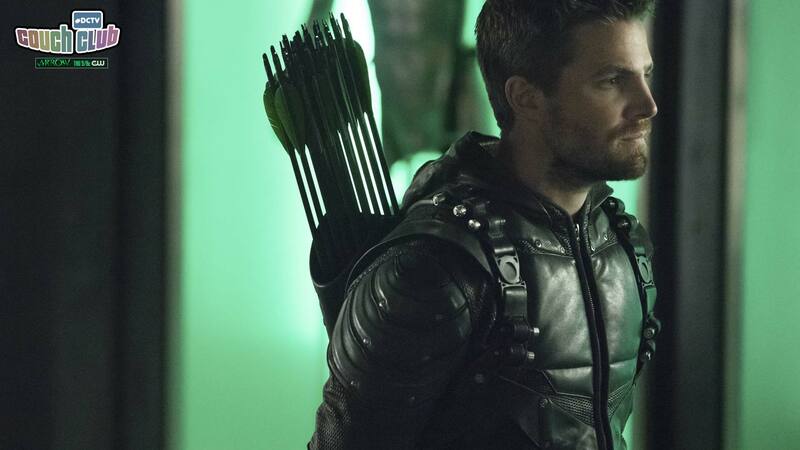 If he’s going to make it through this, Ollie needs to open his eyes, take the energy he’s putting into making things work with Felicity and focus on getting things right with his team, because they ultimately decide his fate. Hey, I understand that not everyone can be a Major Winters from Band of Brothers, but you need to see beyond yourself if you want to lead others—just my opinion. My favorite part of the episode was definitely the ending. I love the idea of all the villains working together, with the icing on the cake being Vigilante deceiving Dinah. By the way, is it safe to start thinking that evil Laurel is somehow actually…well, Laurel? I was kind of confused by that exchange between her and Quentin. I guess we’ll know more as the season goes on. See you next year, Arrow fans!